Enjoy the sweet side of snacking without compromising your healthy diet! 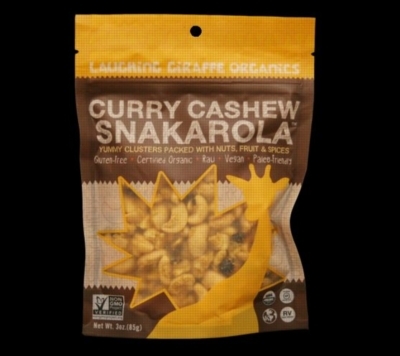 These bites are a perfect grab-and-go, nutritional snack to fuel your day with Snakarola by Laughing Giraffe Organics. Choose from Cran Orange and Curry Cashew flavors. The clusters include a combination of nuts, fruits and spices bound together with agave nectar. Laughing Giraffe Organics offers quality, nutritional snack food made with only the purest organic ingredients. Their snacks are nutrient dense, gluten-free and minimally processed. Laughing Giraffe Organics is a family-run business that operates from San Francisco, CA. Choose from 1 three ounce bag or a six bag case.